1.Bucher HC, Hengstler P, Schindler C, et al. Percutaneous transluminal coronary angioplasty versus medical treatment for non-acute coronary heart disease: meta-analysis of randomized controlled trials. BMJ. 2000;321:73-7. 2.Katritsis DG, Ioannidis JPA. Percutaneous coronary intervention versus conservative therapy in nonacute coronary artery disease: A meta-analysis. Circulation 2005;111:2906-2912. 3.Boden WE, O’Rourke RA, Teo KK, et al. Optimal medical therapy with or without PCI for stable coronary disease. N Engl J Med 2007;356:1506-1516. 4.Brophy JM, Belisle P, Joseph L, et al. 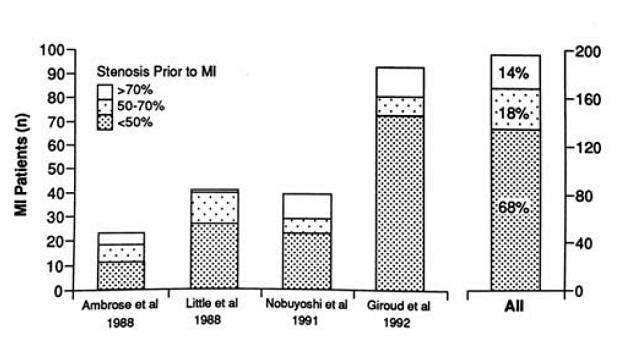 Evidence for use of coronary stents. Ann Intern Med. 2003;138:777-786. 5.Babapulle MN, Joseph L, Belisle P, et al. 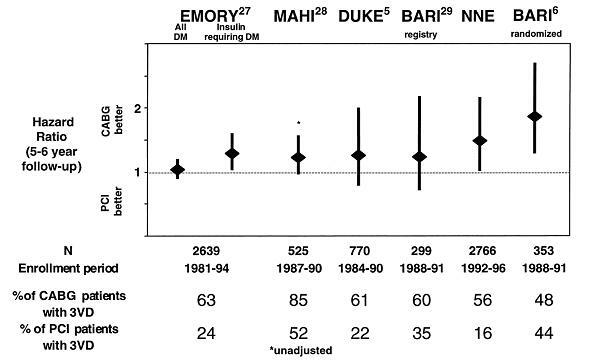 A hierarchical Bayesian meta-analysis of randomized clinical trials of drug-eluting stents. Lancet. 2004;364:583-91. 6.Nordmann AJ, Briel M, Bucher HC. 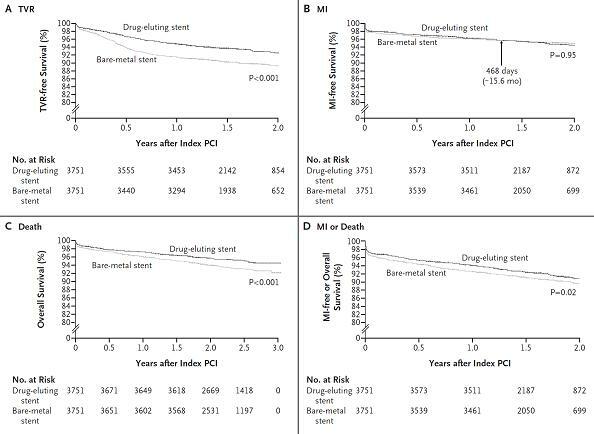 Mortality in randomized controlled trials comparing drug-eluting vs. bare metal stents in coronary artery disease: a meta-analysis. Eur Heart J. 2006;27:2784-2814. 7.Kastrati A, Mehilli J, Pache J, et al. 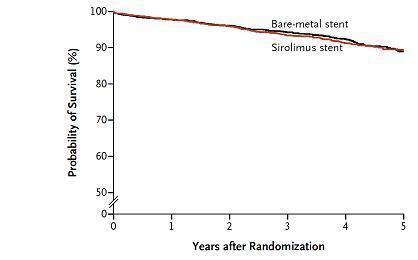 Analysis of 14 trials comparing sirolimus-eluting stents with bare-metal stents. N Engl J Med. 2007;356:1030-9. 8.Lagerqvist B, James SK, Stenestrand U, et al. 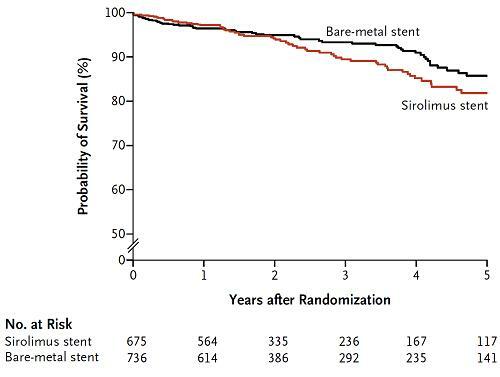 Long-term outcomes with drug-eluting stents versus bare-metal stents in Sweden. N Engl J Med. 2007;356:1009-19. 9.Tu JV, Bowen J, Chiu M, et al. 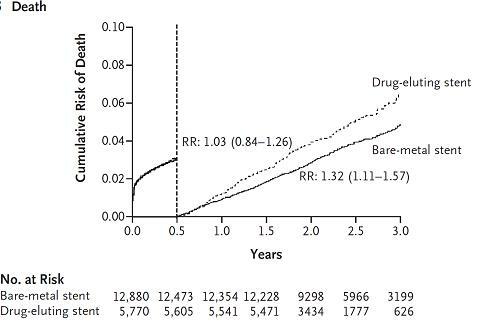 Effectiveness and safety of drug-eluting stents in Ontario. N Engl J Med 2007;357:1393-402. 10.Yusuf S, Zucker D, Peduzzi, et al. 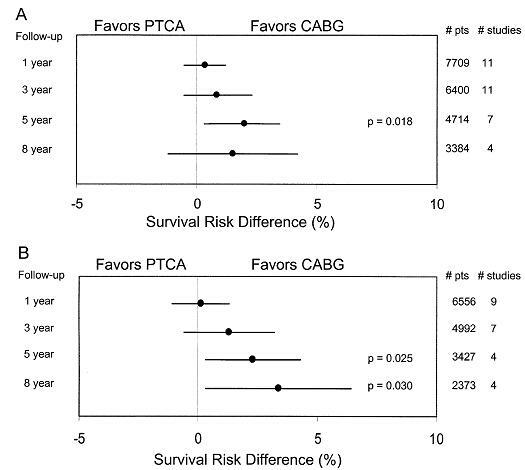 Effect of coronary artery bypass graft surgery on survival: overview of 10-year results from randomized trials by the Coronary Artery Bypass Graft Surgery Trialists Collaboration. Lancet. 1994;344:563-70. 11.Hoffman SN, TenBrook JA, Wolf MP, et al. A meta-analysis of randomized controlled trials comparing coronary artery bypass graft with percutaneous transluminal coronary angioplasty: One- to eight-year outcomes. J Am Coll Cardiol 2003;41:1293-304. 12.The SoS investigators. 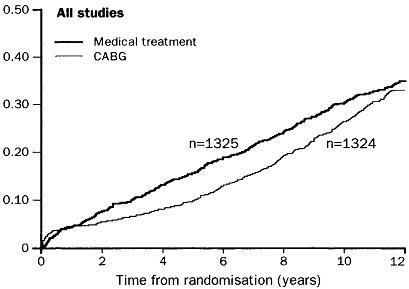 Coronary artery bypass versus percutaneous coronary intervention with stent implantation in patients with multivessel coronary artery disease (the Stent or Surgery trial): a randomized controlled trial. Lancet 2002;360:965-70. 13.Serruys PW, Ong ATL, van Herwerden LA, et al. 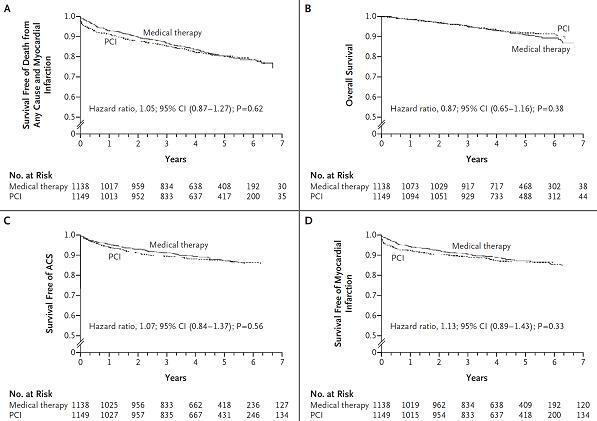 Five  year outcomes after coronary stenting versus bypass surgery for the treatment of multivessel disease. 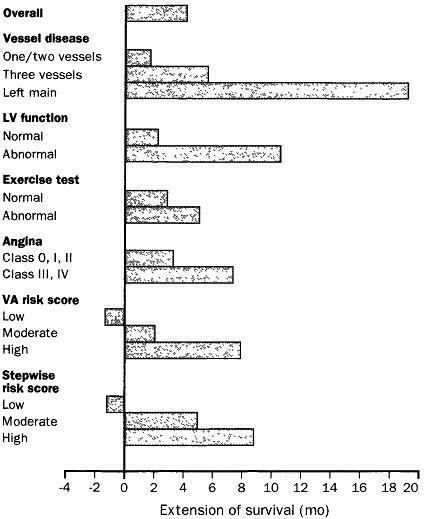 J Am Coll Cardiol 2005;46:575-81. 14.Rodriguez AE, Baldi J, Pereira CF, et al. Five-year follow-up of the Argentine randomized trial of coronary bypass surgery in patients with multiple vessel disease (ERACI II). J Am Coll Cardiol. 2005;46:582-8. 15.Hannan E, Racz MJ, Walford G, et al. 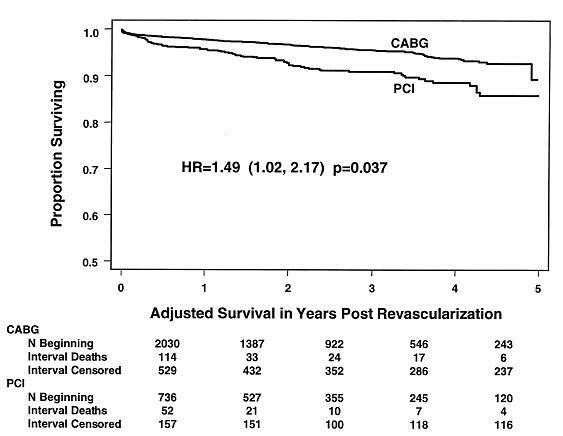 Long-term outcomes of coronary-artery bypass grafting versus stent implantation. N Engl J Med 2005;352:2174-83. 16.Ong ATL, Serruys PW, Mohr FW, et al. The SYNergy between percutaneous coronary intervention with TAXus and cardiac surgery (SYNTAX) study: design, rationale, and run-in phase. Am Heart J. 2006;151:1194-204. 17.Sabate M, Jimenez-Quevedo P, Angiolillo DJ, et al. 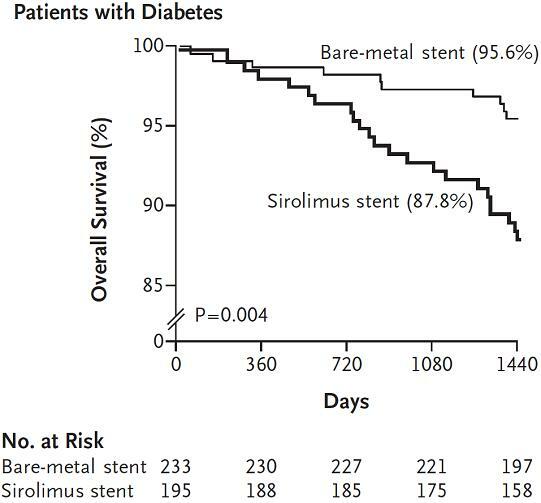 Randomized comparison of sirolimus-eluting stent versus standard stent for percutaneous coronary revascularization in diabetic patients: The Diabetes and Sirolimus-Eluting Stent (DIABETES) trial. Circulation. 2005;112:2175-2183. 18.Spaulding C, Daemen J, Boersma E, et al. 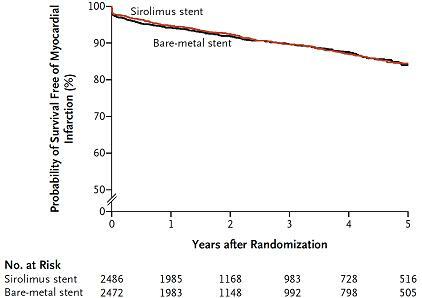 A pooled analysis of data comparing sirolimus-eluting stents with bare-metal stents. N Engl J Med. 2007;356:989-97. 19.The BARI Investigators. 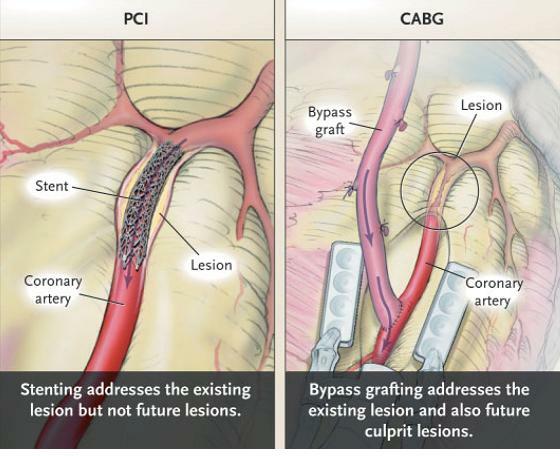 Comparison of coronary bypass surgery with angioplasty in patients with multivessel disease. N Engl J Med. 1996; 335:217-25. 20.The BARI Investigators. Seven-year outcome in the Bypass Angioplasty Revascularization Investigation (BARI) by treatment and diabetic status. J Am Coll Cardiol. 2000;35:1122-9. 21.The BARI Investigators. The final 10-year follow-up results from the BARI randomization trial. J Am Coll Cardiol 2007;49:1600-6. 22.Niles NW, McGrath PD, Malenka D, et al. 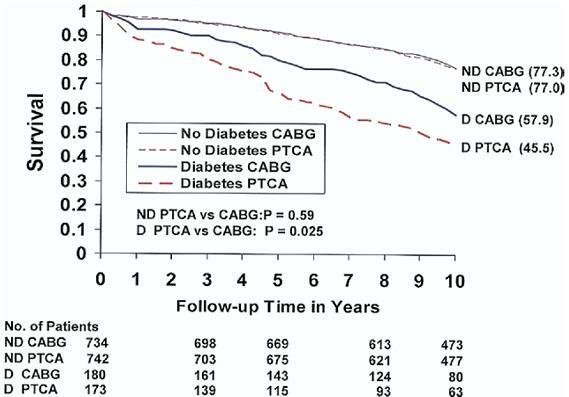 Survival of patients with diabetes and multivessel coronary artery disease after surgical and percutaneous coronary revascularization: results of a large regional prospective study. J Am Coll Cardiol 2001;37:1008-15. 23.Kapur A, Malik IS, Bagger JP, et al. The Coronary Artery Revascularization in Diabetes (CARDia) trial: Background, aim, and design. Am H J. 2005;149:13-9.
http://www.clinicaltrials.gov/ct/show/NCT00086450?order Accessed at June 3, 2007. 26.Booth GL, Kapral MK, Fung K, et al. Relation between age and cardiovascular disease in men and women with diabetes compared with non-diabetic people: a population-based retrospective cohort study. Lancet 2006; 368:29-36. 27.Haffner SM, Lehto S, Ronnemaa T, et al. 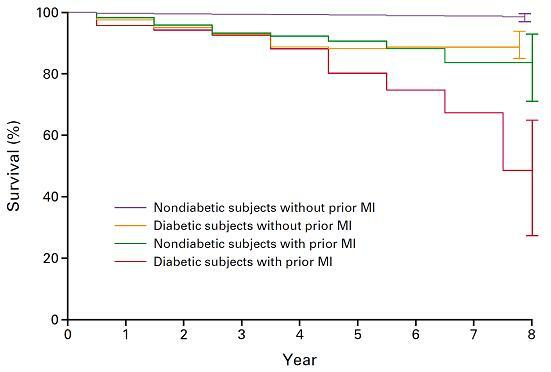 Mortality from coronary heart disease in subjects with type 2 diabetes and in nondiabetic subjects with and without prior myocardial infarction. N Engl J Med 1998;339:229-34. 28.Juutilainen A, Lehto S, Ronnemaa T, et al. Type 2 diabetes as a “coronary heart disease equivalent”; An 18-year prospective population-based study in Finnish subjects. Diabetes Care 2005;28:2901-2907. 29.Malmberg K, Yusuf S, Gerstein HC, et al. Impact of diabetes on long-term prognosis in patients with unstable angina and non-Q-wave myocardial infarction: results of the OASIS (Organization to Assess Strategies for Ischemic Syndromes) Registry. Circulation. 2000 Aug 29;102(9):1014-9. 30.Shindler DM, Palmeri ST, Antonelli TA, et al. Diabetes mellitus in cardiogenic shock complicating acute myocardial infarction: a report from the SHOCK Trial Registry. J Am Coll Cardiol 2000;36:1097-103. 31.Falk E, Shah PK, Fuster V. Coronary plaque disruption. Circulation 1995;92:657-71. 32.Detre K, Lombardero MS, Brooks MM, et al. 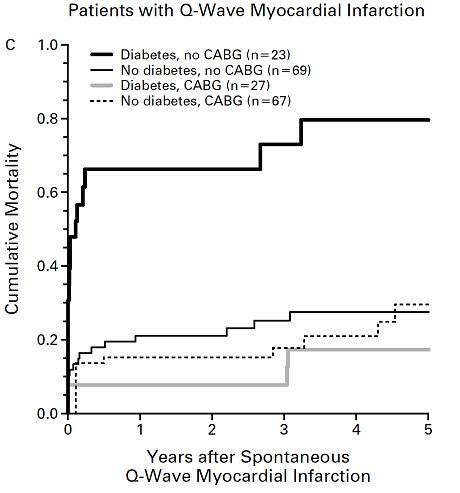 The effect of previous coronary-artery bypass surgery on the prognosis of patients with diabetes who have acute myocardial infarction. N Engl J Med. 2000;342:989-97. 33.Gersh BJ, Frye RL. Methods of coronary revascularization-Things may not be as they seem. N Engl J Med. 2005;352:2235-2237.